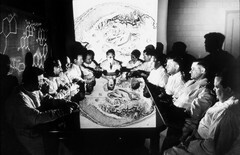 The National Cancer Institute's first scientific staff (1940) gathered around conference room table in the dark with a slide projected on the screen which reflects off the table. Shown left to right: M.B. Shimkin, H. Kahler, M.J. Shear, M.B. Melroy, H.L. Chalkley, R.R. Spencer, M.E. Maver, P.S. Henshaw, H.L. Stewart, E. Lorenz, F.C. Turner, and W.R. Earle.